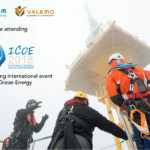 VALOREM MARINE SOLUTIONS is attending ICOE/SEANERGY, International conference on Ocean Energy, from June 12th to 14th in Cherbourg and will be pleased to meet you there! Come and chat with us on our booth B243! Our team will be present at the Offshore Wind Energy of london from 6 to 8 june 2017. We hope to meet you there.